Pjones9's review"Good upgrade, but too expensive for the features you get." Simply put, Pro Tools is a must have for any serious music producer or/and audio engineer. It has been the standard software for audio productions around the world for more than a decade now. It's compatible with Windows XP, Mac Os,and many more, so compatibility issues are practically inexistent. The manual is detailed and straightforward, it comes with detailed description on the specifications and usage. -Track counts have been upped for v10, which will play back up to 96 tracks at 44.1/48kHz and can record up to 32 tracks simultaneously. -64 virtual instrument tracks, 512 MIDI tracks, 160 aux tracks, 256 busses and one video track. -Clip Gain: Every clip has its own gain fader and the waveform will look bigger or smaller when you raise or lower the gain, which is great visual feedback. -It also runs faster than the previous versions; sessions open faster, fades are calculated in real time and general work flow runs smoother. This all new features may seem impressive, however Pro Tools 10 is not much of an upgrade, and some new features for this DAW were included before in other DAWs. I feel that for the price you're paying, the upgrade for this version is not really worth the fee. However don't get me wrong, Pro Tools is still a really useful and valuable DAW , easy to use, reliable (at least more than many other DAW's out there, like Logic, which crashes all the time) and has great compatibility with external hardware. This upgrade would be more suitable for experienced producers who always need to work faster. But if you have the previous Pro Tools version I'd say you should buy one of the next upgrades which will have probably more valuable features for the price. The software is stable and runs smoothly. It runs faster than previous Pro Tools versions, edition is simpler and the Clip Gain feature is useful as well. I used to work with Logic Pro, which is also easy to use but incredibly unstable, there were compatibility issues with hardware all the time; it would not recognize the audio interface sometimes and crashes are recurrent. With Pro Tools I never had this problem and it's very hard to mess up a session; thanks to multiple features it feels very nice to always have a backup of your audio files, no way that cool improvised solo is getting deleted accidentally! In Logic is very easy to delete files without noticing, but in Pro Tools there are several ways to make a reliable backup easily, like the options Save Session as, Session Template, etc. I used this software for about two years and was happy with it. But the upgrades are much better. -New features: clip gain. 64 virtual instrument tracks, 512 MIDI tracks, 160 aux tracks, 256 busses and one video track. -Few upgrades for the price you pay. The program works on any platform either Windows XP, Windows Seven or MAC OS , so I haven't had any kind of compatibility issues. The manual included with the DAw is great , Avid made a great book explaining how the program works , how it's made and the usual functions and basics of it. The typical functions are easy to spot trough a great designed interface with a lot of chapters and topics to choose from. The common installation of the system requires a while, but except for that, it's primary and very straight-forwarding. The application performs very constant and Pro , as you would expect from Avid. The gear is extremely stable and it works without any problems or errors. I'm getting high performances with this Daw , mainly because of how powerful are the build in processes , how advanced are the synths , how good the piano roll is and many other cool features. What I like most about it, It's the stability of the daw and the excellent interface offered by Avid. I like the piano roll window , I like the notation windows a lot , this Daw feels more like you make music than others do. Without a question, one of the most high-quality Daw's that I ever experienced and the perfection and deficiency of any crashes makes it better. I tried many and many Daw's but Pro tools designed by Avid is something quite new even now, the excellent build-in results, those elegant converters , high-quality reverbs, and many other functions make this one of the most used Daw in our time. After getting to know the system quite detailed, I would make the same choice and purchase Pro Tools by Avid, basically because of the interface , stability , power and great notation tools. Pro Tools 10 is a must have for any serious musician or artist looking to get the best possible sound while working with an industry standard DAW. Pro Tools 10 has 96 tracks and comes with 50 plus plug –ins and effects. It can be used on your Mac or a PC if your computer meets the requirements. The best part about buying this DAW is that if you already own a previous version of it you don’t have to pay full price which is 700 dollars. You can upgrade for about 300 dollars. Installing it was quicker than I expected, but if you are a first time Pro Tools 10 user it will take you some time to get the hang of it. It can be very complicated and overwhelming at first because it is so in depth and so different than any other DAW that is available. Pro Tools 10 will run good on your computer, I have never experienced any crashes or freezes. It is a rather big program though so you will need to have enough hard drive space to have it and plenty of CPU to run all of the plug-ins. Using Pro Tools 10 will keep you in the loop with almost every studio across the world. All major studios use Pro Tools to record with and master songs. So it will make it easy to take your songs from your computer to a major studio and back by just using the PTF files. 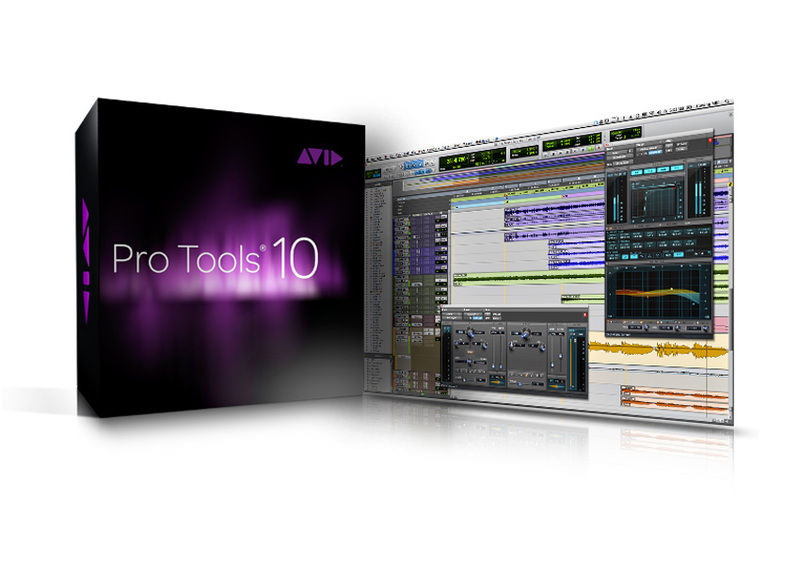 I am happy that I chose to upgrade to Pro Tools 10 by Avid. I look forward to learning more and more by using Pro Tools 10. There are just so many things you can learn, even though I have been using it for a long time. I feel like I still learn something new every single time that I work with a song in Pro Tools 10. Pro Tools is one of the most well-known daw’s right now, it’s being used by many well-known performers and manufacturers. It’s fairly complicated regarding the equipment that are build-in and the whole aspect of the software. The manual of the program is quite clear and sufficient to get a nice understanding how to software works. The general setup of the program takes a while, but except for that, it's basic and very straight-forwarding. The software works very stable and Pro. The gear configuration is well made and I haven't seen any bugs regarding the audio processing. I been using it for a year now, and I gotta admit that the notation features, the great audio effects and midi are very handy regarding the mixing process and mastering. Pro tools new engine has 48-bit fixed point arithmetic and the new compressors make a huge difference concerning the quality of sounds. What I like most about it, It's the stability and the great interface provided by Avid. It's one of the most expensive Daw's on the market right now, however if you own the money, you should try it out and enjoy the whole process regarding mixing and mastering. Without a doubt, one of the most high-quality Daw's that I ever encountered and the precision and lack of bugs makes it even greater. I tried many and many Daw's but Pro tools developed by Avid is something pretty new even now, the great build-in effects, those fancy compressors , high-quality reverbs, and many other features make Pro Tools stay on top. After getting to know the program pretty in depth, I would make the same choice and order Pro Tools by Avid, simply because of it's stability, great interface, and those Pro features provided by it that make a huge difference in your mixing. stompboxjon's review"worth the 299 to upgrade, but if you buy new its gonna cost you"
Pro Tools 10 by Avid has out shined many other daws in my opinion and will continue to do so. After comparing Pro Tools 10 to Logic (which a lot of people tend to do because they say logic is its biggest competitor) I have come to realize that the layout of pro tools is a lot more complex than just Logics. Logics can just easily be figured out without any manuals or training. But with Pro Tools 10 by Avid, they layout is rather over whelming and confused me for a while even after being pretty good in Pro Tools 9 it just seemed like 10 was a completely different software. I have been using Pro tools over the years and they never really change too much just some small things here and there but with 10 I think they made some really good changes to functions and some small cosmetic changes. Performance is very good on my mac, i have been upgraded to 10 since it first came out. If you are just upgrading then you can get 10 for about 250 dollars, but if you are buying it brand new, good luck trying to get it for less than 700 bucks unless you can get the school or student edition. If you can really dig deep in to pro Tools 10 and it will take some time to do so, then you will really start to understand a lot more about mastering your music that you would have never knew in Logic or Cubase. Pro tools 10 gets you really deep into the process of editing audio and understand how to do so will take some time. I am self taught and it took me a while to get it down years ago. But its knowledge that is worth having because it will take your music to new heights and if you can become certified in Pro tools through a course you can actually really start earning some money editing some major projects for some companies. Pro tools 10 Rocks. Avid finally went to downloads only for Pro Tools 10. Which is much preferable for me than waiting for a boxed package to arrive. Buy download, install, work! I like it. Install and dongle update went without any issue. For an Avid product the manual is actually comprehensive and easily enough digested. The new features on Pro Tools 10 is what made me jump on an early version and it runs fairly stable to my surprise. The stand outs for me are that Audio Suite plug-ins know can be frozen. I rather would've had track freeze but I will settle for this for now. Also object based volume automation ala Samplitude/Sequoia. Which for some one like me that has spent many years in Smaplitude/Sequoia is a must. Unfortunately you need the Complete Production Tool Kit or HD system to convert object based automation into volume curves. Oh well...I don't think I want to spent another 2000 for that. The other thing I'm missing that's part of the tool pack is that you can customize your system cache and various other settings for performance improvements. It works as advertised. Still has some of the Avid/Digi Design oddball concepts I will never understand. Like that short cuts aren't user definable. And worse what about commands that don't have short cuts. I will never understand that. Finally Avid stopped claiming that none needs or wants the ability to record at 32 bit float. Guess after years of Steinberg doing it finally it was acceptable. WHich raises a bit of an issue with backwards compatibility. But Avid actually took care of it. The file extensions are no longer .ptf they are now .ptx. And if you have a project that has 32 bit files you want to open in a prior version of Protools you need to save it as "earlier version Protools 7-9" where it converts those to 24 bit files. I work in it, there is room for improvement. The 299 upgrade is IMO too high it should be 199.- but it is a necessary evil. PhiBee's review (This content has been automatically translated from French)" Essential but not unique!" User PC and MAC for 10 years (standard or HD version, depending on location), I work in a personal capacity (small home studio) with version 10 currently on a Macbook pro i7/16Go/SSD. I talk about my version 10 non HD. Trouble-free installation (upgrade from V9 itself V8 on MAC and PC), sound cards accepted (after reinstalling drivers) - Mbox2 and EDIROL UA-101. No hardware incompatibilities (master keyboard and Faderport) or software (continued Komplete 8 by Native Instruments RTAS + result Waves). Recognition iLock ok despite a bug update (which I have not suffered since warned before). Macbook Pro 2012 - i7 - 16GB ram - SSD system - 2 external LaCie drives. Sound card used: Edirol UA-101 USB, I dropped the Mbox2 more very reliable. Never was limited processing power and disk speed, despite the insert or plug in the audio-instruments, but I usually running with an average of 30 tracks (audio half, half virtual instruments). My little config suits me and does what I ask him without flinching: creation / sound design for short films, audio book, documentary mix ... etc. Protools for 10 years, this version 10 since its release! I tried Cubase, Logic and Live. : Power, stability and plugins included. Coexistence between two generations of home plugins. Least: the twelve o'clock edition perfectible, but major efforts made since the older versions (I'm talking about 6/7 and above!). And if I were to suggest something a beginner or amateur, I'd rather him live more in the new design and very powerful, especially as there exists a "lite" version, something inconceivable for Avid: p (but they have made an effort to test a version with limited time, it's something). I am from the beginning an enthusiastic user of Samplitude, special software which is the audio. But this only works perfectly on Windows, and this is the Achilles heel of this software. After a recording session that turned into a nightmare thanks to XP crazy, I decided to switch to Mac. I do not have the Logic loved everything and I turned to Pro Tools 10 that I immediately loved. No problems with installation or configuration. Everything turned immediately and has so far never failed. Unlike the Logic which is very poorly done, the manual is very clear and didactic. Mac Book Pro, TC studiokonnect 48. One feels immediately that the software has been designed by professionals for professionals. Ie that everything is done to make the job easier, faster and more efficient. There are a multitude of functions that simplify your life and allow you to do quality work. The sound is excellent (much better than Logic for example) as well as the stereo rendering. on the other hand I found a little stingy Avid at the plug ins provided. Some are good, but it lacks a multiband compressor, reverb worthy of the name, everything about sound analysis: spectrogaphe, spectrometer, etc. correlator phase. All this is found in Samplitude with a bonus CD burning module to the standard RB. When you need to buy all those plug-ins, the bill rises quickly. And then there's the new Pro Tools 11, which is controversial, as RTAS plug-ins are no longer compatible, as well as some avid hardware. johnhenry69's review (This content has been automatically translated from French)" The same as the 9"
At the end of Pro Tools 9, I bought the upgrade a pro tools 7 to 9, 10 is output shortly after I was able to get a license for it without having to pay more. SAR level of implementation, the software is not stable or more stable than its predecessor pro tools 9.
works well with different audio interfaces (M-Audio profire, m box 2, ect ...). some software crashes but nothing too bad. Having received an update pro tools 9 to 10 at no extra charge (after purchasing an upgrade pro tools 7 to 9) I can not judge the value for money that the upgrade pro tools 7 to 10 .
read the reviews on pro tools 9 for you to your idea. In the end, for me, the only REAL difference between version 9 and 10, it is the ability to update the software in French, for the rest I'm still looking! In the sense that in my case, the upgrade did not cause me to do more, the quality ratio is very good. But to pay for an upgrade only to change the language ... I do not see the point. djdkdance's review (This content has been automatically translated from French)" A little complicated ...."
No worries, I had the opportunity with version 9 update in 10 from the Avid website. Ben is especially long to understand how to configure all the I / O outputs of the external processing modules. Yes, but should not be a novice. Intel i7 3.6Ghz - 32G ram - 1.5T disk. A little time to load but after no worries. - Gas Plant to configure all, must be a good day config. Gliomas so dificult to find some basic features compared to other programs. Yes, because it's still a standart and with no incompatibilitées project between studios.